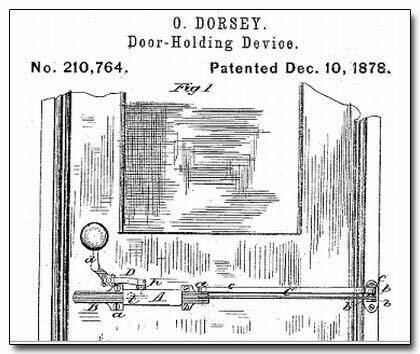 In 1878 Osbourne Dorsey submitted a patent for improvements on the door latching device, and thus introduced America to the door knob. Prior to doorknobs, most people used latch-string devices which could only be opened from the inside. Wealthier individuals often used key holes and locks. The door could only be opened when the key was turned in the lock. The lock and key option was generally too expensive for the average person to afford. With Dorsey's door knob, The average person could have a bit more ease and security.